Premium Compatible Label Tapes for the Brother P-Touch 1280 printer. The Brother P-Touch 1280 is an affordable, portable and feature-packed label printer designed for the home and office users. The printer has ergonomic design and is simple to use. The printer measures 6.28 x 5.94 x 2.36 inches and it weighs around 0.47Kg. It features a QWERTY keyboard and has one line, 15-character LCD display screen. This handheld device comes with a built-in cutter to cut the labels after printing. The printer has five framing options and six auto formats to customize the label according to the requirement. The text size is automatically adjusted according to the width of the tape. It allows to save and print most frequently used labels by providing three favorite keys. The printer can print up to 12mm wide laminated labels. It has a printing resolution of 180 dpi. This label printer supports different types of labels such as standard laminated, non-laminated iron-on fabrics, acid-free, flexible ID, and extra strength adhesive labels. It allows to create personalized, decorative labels using the large variety of styles, framing modes and formats with Brother P-Touch 1280 Label Tapes. The Brother P-Touch 1280 printer is easy to use with a fairly large display screen and a neat keyboard, but it lacks a more reliable power source and it has only one font. This is a small user-friendly machine that can be used for different types of uses. With a variety of choices of styles, formats and framing modes, the printer is more than versatile. Q. What is the benefit of using Mirror printing and how it is done? A. It provides flexibility to read the printed text. Use clear Brother P-Touch 1280 Label Tapes in [Mirror], so that the labels can be read correctly from the opposite side when attached to glass, windows or other transparent surfaces. Q. Can I print barcodes using Brother P-Touch 1280 Label Tapes? A. No, the printer does not support printing of date/time stamps and barcode printing. Q. 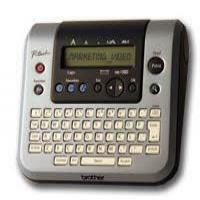 How many text lines can be printed using Brother P-Touch 1280? A. The maximum number of text lines that can be printed from the Brother P-Touch machine depends on the width of the tape installed. The maximum number of lines that can be printed is 2 if you use large size of Brother P-Touch 1280 Label Tapes. Q. The machine has locked up and nothing happens when I press a key, even though the machine is on. I don't know what is wrong with the machine? A. If you face this type of problem, turn off the machine and then while holding down the ‘Shift’ and ‘R’, press the power button to turn the machine back on and then release ‘Shift’ and ‘R’. Note that it can affect the text and other formats in the display and all text files stored in the memory will be erased. Also, the language and other unit settings will get cleared. Q. My machine prints blurred labels. What is the issue? A. If the characters printed on the labels are blurred, check that the tape cassette has been inserted correctly in the machine. If the Brother P-Touch 1280 Label Tape is empty, replace it with the new ones and then check the print results. Q. How can I clear the display of P-Touch 1280? A. To do so hold down the Shift key and press the BS (Clear) key. All text and formats will get cleared. Q. Why does my machine display ‘Check Battery!’ when I press the print key? A. The batteries might be running low. Replace the batteries with six new AAA (LR03) alkaline batteries of the same type to make them work again. Q. What can be done if I got the error message that the text is too long? A. The text length exceeds the selected label length or the selected Auto Format setting length. Change the Width setting to x 1/2. Q. How can I type symbols on my Brother P-Touch 1280? Press the Symbol key to enter the Symbol selection screen. Keep pressing the symbol key until the desired category appears. Press the cursor key until the cursor is located under the desired symbol. Then, you can click on OK to add the symbol to the text. Q. What precautions must be kept in mind while printing the labels? A. To cut off the label, push in the tape cutter lever on the upper-right corner of the machine. To prevent damage to the Brother P-Touch 1280 Label Tape, do not try to cut it while the message ‘Print’ or ‘Feed’ is displayed. Q. What are your delivery charges on the purchase of Brother P-Touch 1280 Label Tapes? A. The delivery charge for any item is around £1.99 inclusive of VAT. The cost of delivery will go higher depending on the weight. Q. Do you provide genuine Brother P-Touch 1280 Label Tapes or only compatible ones are available on the site? A. We at Printer Ink Cartridges offer premium quality compatible label tapes for the Brother P-Touch 1280 printer that works effectively well and produce good quality labels same as the original ones.